Church and State's Tony Esnault creates an annual croque-en-bouche. Tis the season to put on those comfy expandable yoga pants and make a note to renew your SoulCycle membership, because there’s sweet and decadent French temptation all over L.A. this month. At the popular French bistro Church and State in the Arts District, chef Tony Esnault will unveil his annual croque-en-bouche on Friday. This is a towering mountain of petits choux, more commonly known as cream puffs, bound together with threads of golden caramel that will be on display for the rest of the month. 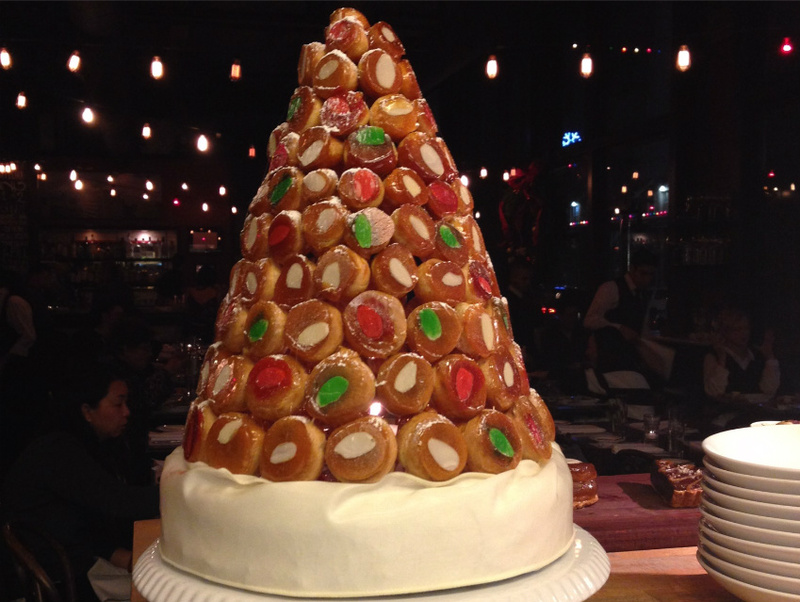 You can order a taste of croque-en-bouche ($9) for dessert and also get festive with the tarte aux figues et oranges, a fig tart with pistachio frangipane, pastry cream, and orange zest ($9), or a plate of profiteroles ($9). For those looking for a French method of warming up these “wintry” mornings, stop by Clementine in Century City for chocolat chaud. Chef/owner Annie Miler puts her own Cali-Mex spin on traditional Parisian hot chocolate by including cinnamon, and each cup ($4, you can also order it in jugs from the catering menu if you’re feeling generous or greedy) comes with an abundance of housemade marshmallows. Bouchon’s bûche de Noël is a chocolate cake with caramel cream. 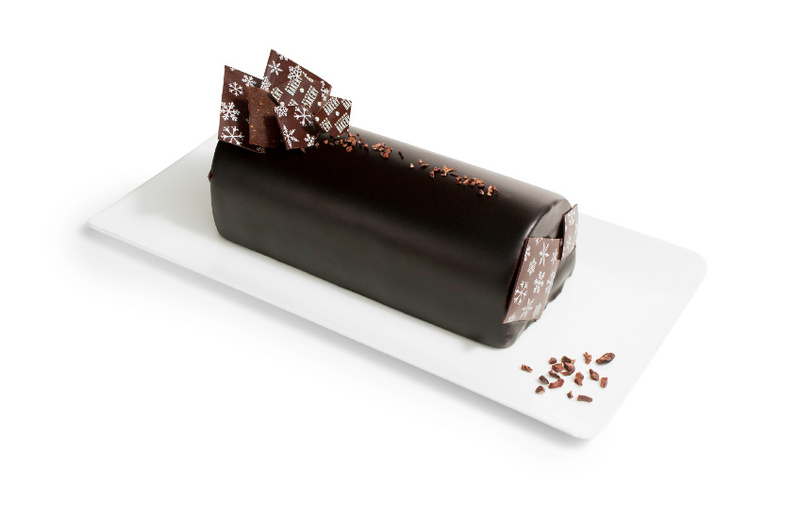 Knock your feasting dinner companions’ stockings off with Bouchon Bakery‘s bûche de Noël. This year’s Yule log treat is a chocolate cake filled with caramel cream, then encased in dark chocolate and sprinkled cocoa nibs, and chocolate balls (serves six to eight, $48). It can be ordered from now until Christmas. It also comes in individual portions at the Beverly Hills bakery ($6.25). The terminally sweet-toothed can swing by Monsier Marcel in the Original Farmers Market or on Santa Monica’s Third Street Promenade for a Duverger dark-chocolate peppermint and red-velvet macaron holiday gift box ($19), also found at select Whole Foods throughout Los Angeles. Lastly, to please any chocolate lover in your life, pick up exquisite handcrafted French chocolates from L’Artisan, a Downtown shop run by a Korean and French chocolatier duo that’s nestled right next to Bottega Louie. You can select your own assortment of 24 chocolates (like a French marzipan with kirsch, a cherry liqueur) for a gift box ($59).